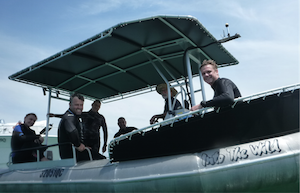 Freediving Gold Coast’s vessel was purpose-built for doing exactly what we wanted to do – freedive the Gold Coast. This centre console aluminium commercially registered vessel is a 5.2m Ocean Craft made from marine grade plate aluminium forming airtight and watertight tubing. This makes our vessel extremely stable and unbelievably buoyant (compared with other aluminium hulls). The length of our vessel is 5.2m but it’s her width that makes her special as, unlike other inflatables or rescue boats, her width allows for ease of movement around the sides of the boat and contributes to her overall stability. Her length, width, v shaped hull with her shallow draft let’s her move anywhere around the Broadwater with speed and manoeuverability. Basically, she’s a great freediving boat – and we love her. Our open water courses and fun days / open water training days are within 3 nautical miles of shore (just under 6 kms offshore) with the Gold Coast Seaway providing safe access most of the year. The Gold Coast Seaway, the southern entrance to the Moreton Bay Marine Park, had the world’s first sand bypass system built in 1986 and was a credit to Dutch innovation. Without it, our Southport entrance to the sea would’ve continued creeping north anywhere between 4m – 60m per year (it’s called littoral drift). No way, I hear you say. Well, consider this, in the early 1800s, the entrance was opposite where Gold Coast’s Jupiters Casino now stands. In the 1930s, Pacific Ocean access was where Seaworld now is. (If you look across the carpark at the Gold Coast Aquatic Centre some of the old Seaway wall is still there – in recognition of the Southport’s changing landscape). With all that movement of sand it made her unpredictable and dangerous. Thanks to Dutch innovation our permanent sand bypass system helps to keep 500 000 cubic metres of sand shifting north of the entrance each year. Weather and sea-state permitting and with attention to the rising and ebb tides, there are few days in the year where we can’t safely cross the bar. We also use the boat to provide access to the Gold Coast’s Wavebreak Island and diving from the boat in 8 to 10 metres depth of water just off the north eastern part of the island. Wavebreak Island is exactly as the name says – a wave break. It was also constructed at the time of the seaway entrance. It’s become a local favourite spot –accessible by boat only and makes a great little dive spot for discovering and learning to freedive. When entering the Gold Coast Seaway onboard our vessel – let your imagination drift to the abandoned Township of Moondarewa below us – the Gold Coast’s answer to a ‘Lost City of Atlantis’ – of which only sand now lies beneath. Abandoned due to cyclone in 1938 and lost entirely by the mid 1980s. Such it is when we build our castles in the the sand.